Commissar Ciaphas Cain is back, this time fighting for life and honour on the planet Nusquam Fundumentibus (get it?) which is suffering from orks. The action starts pretty much from page one and barely let’s up until the end. 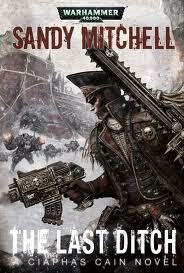 Ciaphas soon discovers the orks aren’t the only threat on the planet, and soon everyone’s up to their knees in blood and guts. With his previously established credentials as a hero, Cain is forced to constantly put himself in harms way, despite his personal opinion of his own self-importance. For anyone unfamiliar with the commissar, and his odorous aide Jurgen, this is the more humorous side to Warhammer. We still have the big men with big guns, but we also have women with big guns, and other assorted people who may or may not have weapons, big or otherwise. The story is well written, the characters all well-rounded, and the plot all hangs together as it should. 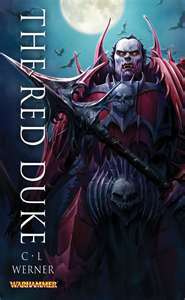 There are some nice set pieces of course, and it reads just like many other Warhammer novels. Which is, ironically, where the problem lies. It’s a good book, don’t get me wrong, but anyone new to the hero wouldn’t know he’s supposed to be something different. The book should be full of false bravado, outrageous co-incidence and blind luck. But this time we have very little of that. The character of Cain himself is starting to blur, to become like all the other Warhammer heroes. Come on Sandy, get back on track, I’m a big fan of the old Cain, but this guy is getting too ordinary.